Summer has hit the North Pacific! Winter swells have subsided and Chinook Salmon, Halibut and Humpback Whales are back in numbers on the continental shelf near Tofino. 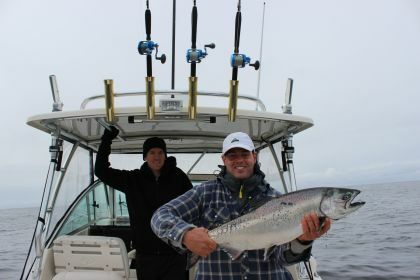 Anglers fishing out of Tofino enjoy a fantastic range of fishing options and an excellent range of accommodations and restaurants. Choose from a full or half day saltwater charter, a family fishing and sight seeing trip perfect for first time fishers, or experience the the finest west coast wilderness on a remote freshwater fishing adventure. Late spring and early summer is a fantastic time to target Columbia River Chinook Salmon (Kings) as they pass by and halibut are a regular by-catch this time of year. 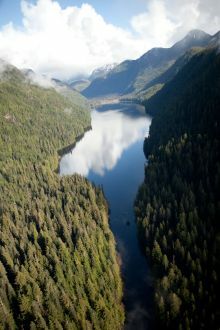 Whether your an experienced angler or a first time fisher, Tofino is a great place to start. Follow us on Twitter to stay up to date with the latest fishing information from the west coast. 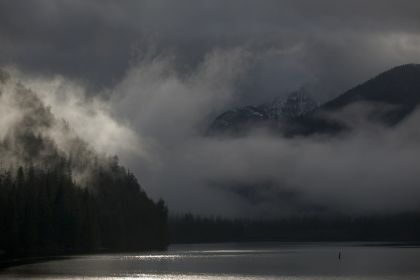 Join Lochie MacKenzie a long time fly fishing instructor and a former guide at the prestigious Silver Hilton Steelhead Lodge to learn to cast, or polish up your stroke. Lochie specializes in Spey and overhead techniques. A remote river drift is a great place to take your fly-fishing skills to the next level and hook a few nice trout while your at it! Have a look at our freshwater options. Enjoy a day on our raft or experience the freedom of your own personal watercraft. After three years aboard the "Rye Not" we have upgraded out primary vessel in order to remain on the leading edge of sport fishing vessels available on the west coast of Vancouver Island. The "Red Sky", a Pursuit 255 Offshore, the replacement for the discontinued 2570 line, offers a significant increase in interior space, and is equip with the best small vessel electronics available in 2013. The first thing returning guests will notice is the increase in size and comfort of the seats in this vessel. A larger displacement, twin 150HP Yamaha four strokes, a Lowrance electronics package complete with a 12 inch touch screen, structure scan side scanning sonar, and broadband Radar are a few of the other highlights of the "Red Sky". We are sure you will be pleased with this vessel. The "Rye Not" remains in the Tofino fleet and will be available as a second boat through Tofino Fish Guides. More pictures and information.